A unique process to get super-clear on who your perfect audience is for your videos (the profitable ones) and what messages they need to hear. 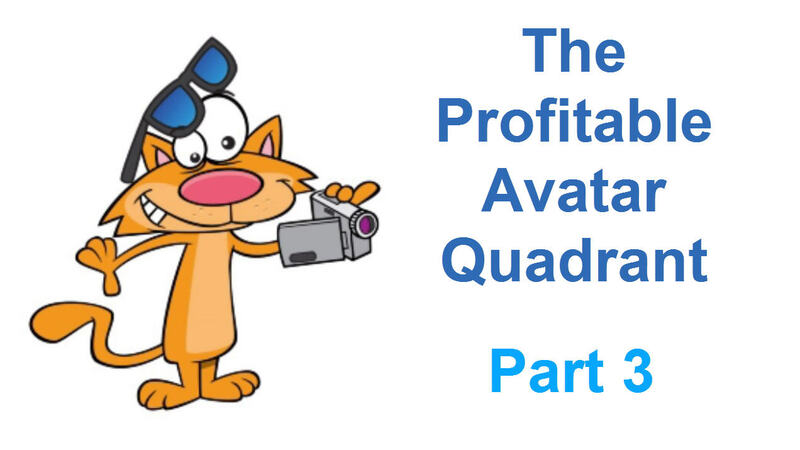 In Part 3 of 4 everything you've been doing so far all comes together to complete The Profitable Avatar Quadrant. Very exciting. Expected Outcomes: This video is Part 3 of 4 in The Profitable Avatar Series. Everything comes together in this lesson as we take all the info you've gathered in 2 and plug it in to the Profitable Avatar Quadrant. I also take you behind the scenes of how I've applied this process to my own business. Plan Your Time: 30 minutes for this page. 2 hours for all 4 lessons including doing the exercises. This module is mega-important so don't skip it ok! You may need some help from other people when doing this exercise because sometimes, as business owners, we are just too close to our business to see what is obvious when you look at other people's businesses. So come over to the Private Facebook Group and we can help. Step 2: Download, print out and grab a pen to brainstorm, using the Profitable Avatar Quadrant Template.